I’ve resumed my ‘Spotlight on’ series with a short interview with designer Sef Farrugia who recently opened her first shop in Rabat. Instead of the focus I usually apply to the designer’s personality, I concentrated instead on the opening of Sef’s very own space and what built up to it. I have been designing for as long as I remember, however, I’ve been doing it professionally since 2012. Since my work structure is based on creating collections, I do not have one sole source of inspiration and in fact, you will find that with each and every collection I try to reinvent myself. I get bored very quickly and am always looking to create and research something new. That said, my work is heavily influenced by the Maltese Mediterranean surroundings and the enigmatic stories that make up our history. I also dabble in the notion of identity. The end result is a contemporary visual with quirky characteristics. My latest collection ‘SAFFI’ is based on Malta’s geology. What led you to decide to open a shop? It was an unplanned move; I was not planning on opening a physical shop! The opportunity came along and I decided to jump in and take the risk. The shop has given me the chance to directly reach out to people and have close contact with new customers. It has now been a bit more than a week since I launched the space and things seem to be going well. What has gone into the process of getting the shop up and running? It has taken a lot of blood, sweat and tears. 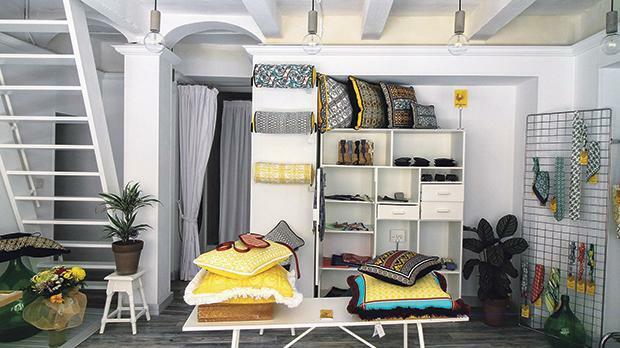 The shop is situated on Republic Street in Rabat and the location used to form part of Old Mdina which meant that the building itself needed quite a bit of restoration, as well as aesthetic help. It took a long time, but with a collective effort, we gave it new life and regenerated the space into a studio space, as well as a shop space. We produce everything under one roof and although the shop space is a humble one, each product is hand finished and limited in production. What can people find in the shop at the moment? At the moment we offer products ranging from women’s and men’s accessories to organic cotton and silk cushions. I hope to get back to making clothing collections in the near future. As well as readily available products, we offer a bespoke service for weddings and other occasions. What advice would you give to someone who wants to open their own shop? Just go for it, there’s no right or wrong time.